Why would the Cavaliers sign Dwyane Wade? For Cleveland, keeping LeBron James happy at all costs is well worth it. The unusually sunny disposition from their leader is exactly what these Cavaliers need, following a tumultuous off-season that saw a Kyrie Irving pack up his crossover dribbles and conspiracy theories to head to Boston following a sound defeat in the Finals. James’s moods and his demanding on-court demeanor are always the subject of constant scrutiny, but never more so than during a contract year. Rumors about his 2018 free-agency options have swirled since June, and it was easy to read Irving’s departure as a preemptive strike to beat James out of the door. Indeed, Irving’s successful trade request only made James’s already tight spot even tighter. The four-time MVP has good reasons to leave Cleveland come July 1, including: owner Dan Gilbert’s bungling of the David Griffin saga; the Cavaliers’ limited cap flexibility; the desire to change the narrative should he lose to the Warriors for the third time in four years; the opportunity to write a new chapter and expand his business empire in L.A.; and the chance to take his best shot at a fourth ring by joining the always-awesome Spurs. Irving’s departure stripped James of his right-hand man and a proven, potent Finals weapon. It also forced James to rely on an injured Isaiah Thomas, a deteriorated Derrick Rose and a fully washed Jose Calderon to pick up whatever portion of the slack they can manage. To be clear, there will be a lot of slack. Despite Irving averaging career-highs in scoring and usage last season, James led the NBA in minutes per game and ranked third in touches per game. When James was off the court, the Cavaliers posted a minus-8.5 net rating, which would have ranked dead last overall. In the eight games he missed last season, Cleveland went 0-8 and lost by an average of 16 points. James is accustomed to shouldering monster burdens, but he’s in for some seriously heavy lifting until Thomas is back on the court and fully up to speed. Early on, something will almost certainly have to give. Either Cleveland will lose more than it’s used to on or James will be asked to dial it up to superhuman status more often than usual. Both scenarios are bound to be at least occasionally frustrating for James, who must also guide the acclimation process for newcomers like Rose, Calderon and Jeff Green. While James has spoken glowingly of Rose, perhaps to boost his confidence and buy-in, the 2011 MVP is a total non-shooter and a completely untrustworthy defensive player. Calderon couldn’t guard anyone when he was 26 and his 36th birthday is Thursday; Green’s night-to-night inconsistency could turn a toddler’s hair gray. These conditions—the organizational instability, the hole left by Irving, the new roster parts, and the ongoing 2018 free agency talk—are precisely why signing Dwyane Wade matters for Cleveland. At 35, Wade will struggle to contribute positively in a theoretical Finals match-up with the Warriors for the same reasons as Rose: His lack of three-point shooting shrinks the court and his declining defensive awareness and spotty effort make him an easy target for exploitation. During the 2014 Finals against San Antonio, a 32-year-old Wade lagged badly, posting a miserable minus-17.4 net rating as Miami fell in five games. It’s a bit terrifying to contemplate how much worse things could get for him against the Warriors come June, and both Jae Crowder and J.R. Smith will almost certainly be far better options. But first-year Cavaliers GM Koby Altman has a more immediate priority than dethroning Golden State: He must keep James as happy as humanly possible. No one expects James to be giggling like he was on Monday all season long, but Cleveland needs him to lead with positivity, lest its season get swept up by fear-mongering over his possible departure. At various times since his 2014 return to Cleveland, James has appeared fed up with Dion Waiters, frustrated by Irving, disillusioned with David Blatt, and furious with both Tristan Thompson and Kevin Love. Irving’s exit should be a wake-up call to James that Cleveland’s culture wasn’t where it needed to be; In turn, Wade’s presence should help James get through the day-to-day slog and manage the inevitable bumps in the road. In his handling of Irving’s trade request and in his execution of the Irving trade, Altman showed a knack for placating James. At his first press conference, Altman repeatedly stressed that he and James were on the same page and that winning the 2018 title was his priority. By acquiring Thomas and Crowder, Altman proved that he had meant what he said, gifting James with a passable Irving replacement and a classic 3-and-D wing. There were plenty of alternate ways for both scenarios to play out: Altman could have played hard ball with Irving, he could have failed to land a top-shelf point guard, or he could have sought younger pieces and more draft picks in the return package. Any of those eventualities would have made James’ life less comfortable this season. Altman, therefore, has done well to appease James, and the Wade signing only adds to that. There are basketball concerns to consider even before the playoffs arrive. Wade’s efficiency has decreased every season since 2012 and his True Shooting % has decreased every season since 2013. His “Three Alphas” grouping with Jimmy Butler and Rajon Rondo last season was a spectacular failure, and playing him with Rose is likely to encounter many of the same floor-cramping and bucket-conceding issues that plagued the Bulls. He’s bound to miss 10 to 20 games with minor health issues, he found himself in the middle of some locker-room squabbles in Chicago, and he’s only known life as a starter during his 14-year Hall of Fame career. Will LeBron James Take a Shot at Politics Post NBA Career? 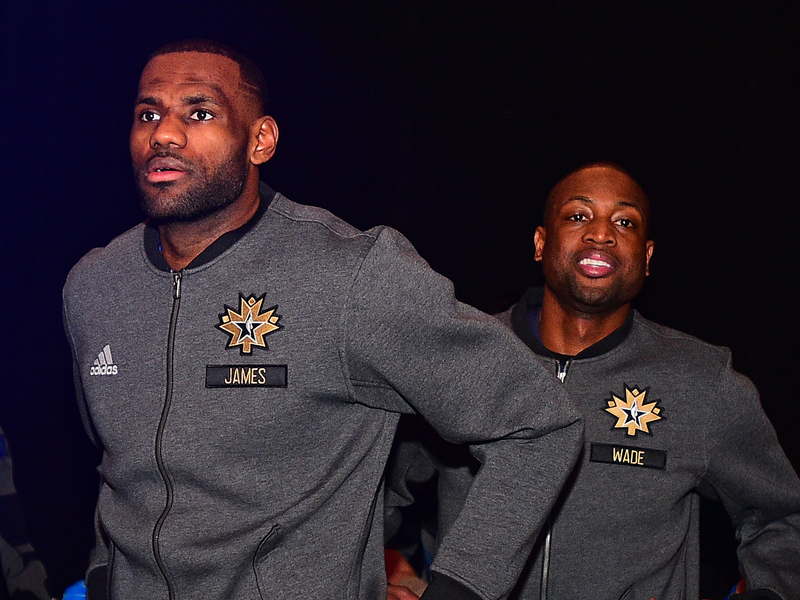 Can James extend Wade’s career like he has for players like Richard Jefferson and Kyle Korver? Will Wade accept a bench role if (or when) it becomes clear such a shift is in Cleveland’s best interest? Will winning bring out his best effort? Will his best effort be enough? Ultimately, adding Wade is less about raising Cleveland’s ceiling and more about keeping James’ spirits up. A happy James gets the new-look Cavaliers off on the right foot. A happy James grins and bears it while playing heavy minutes during the dog days. A happy James is ready to welcome Thomas back with open arms for the playoff push. A happy James smacks Irving’s Celtics in the playoffs and seeks another triple-double average in the Finals. And, in Altman’s dream scenario, a happy James decides to run it back with his buddies in Cleveland next season rather than explore greener pastures. Given the circumstances, it’s not crazy to bet on a great friendship going a long way, even if Wade’s greatest playing days are behind him.